Tart summer gooseberries are so well known for many classic British desserts, Gooseberry Fool being one of the most famous. Though they work well teamed with sugar, cream and the like, they also shine when used as a savory dish. This super-simple gooseberry relish recipe has a lovely balance between sweet and sour, thus making it a great accompaniment for fatty meats and fish, duck. Mackerel is the most obvious but don't discount serving it with pork as well. The relish is also lovely served with strong cheeses. British gooseberries are more usually green but they are also in other lovely colors including red, yellow and purple. In this recipe, I have used red gooseberries, but any of the colors will work as well. A relish should not be confused with a chutney. A relish is somewhat similar but though both use sugar and vinegar as preservatives, the relish has less of both. Less sugar means the relish will not keep as well as a chutney, only a few weeks in the refrigerator, not much longer. In a medium-sized saucepan heat the oil, add the onion and cook gently for 3 minutes. Add the finely chopped garlic and cook for a minute more. Raise the heat slightly and add the vinegar, cook for one minute to produce a thick glaze. Add the water and stir, then tip the gooseberries and ginger into the pan. Over a medium heat, cook for 20 minutes stirring from time to time. Keep an eye on the pan to make sure the relish doesn't burn, if it starts to stick lower the heat and cook a little longer. The relish will thicken as it cooks but should never be too thick or sticky. Remove the pan from the heat, leave to cool slightly (about 10 minutes) then taste and check for seasoning. Add salt and pepper to taste. Place the pan to one side. Meanwhile, rinse a couple of small jam jars and lids in hot, soapy water, rinse and dry thoroughly. Once the relish is cool (it doesn't need to be cold) stir in the Elderflower cordial a tablespoon at a time until you get the flavor you like. Fill the jam jars with the relish, cover with a lid and leave to go cold. Store the jars in the refrigerator and use within three weeks. The relish can also be frozen but is actually at its best fresh. Serve the relish with your favorite cheeses, cold ham, cooked duck breast and is also delicious with pan-fried mackerel. 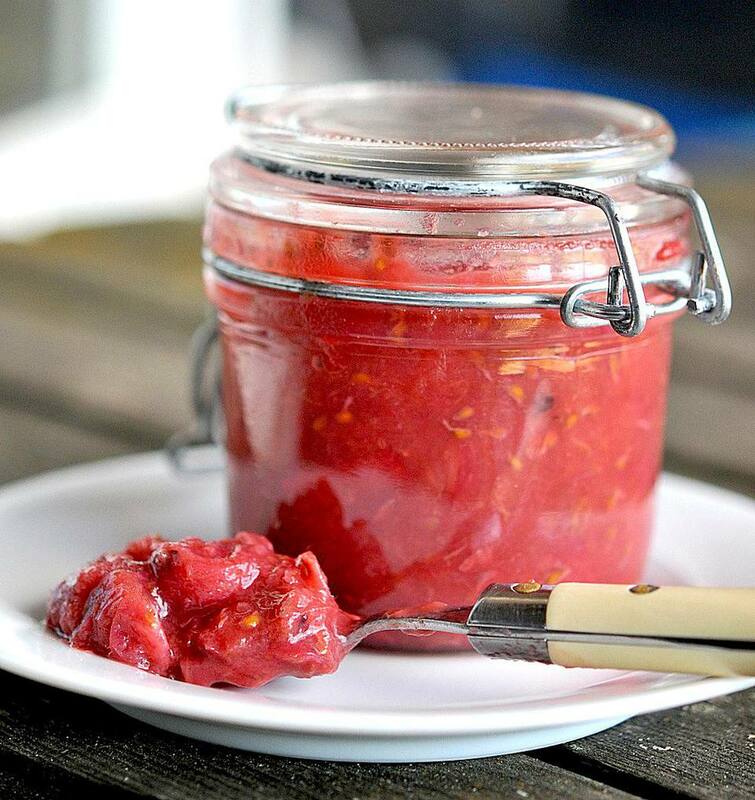 The gooseberry relish interchanges very nicely with savory dishes using rhubarb relish.